Nail surgery is a procedure carried out to remove part, or all of a nail. Problem nails that we commonly treat are infected, ingrowing toenails, and curved or distorted/ thick nails that are causing pain. Phenol is used to stop regrowth of the nail. Permanent removal of part or the entire nail often cures the problem, although there is a small risk of regrowth. 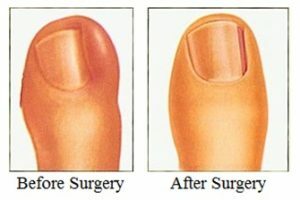 This procedure is known as “Phenol Matricectomy” and has a success rate of 95% or higher, in preventing regrowth of the nail. What will happen when I have nail surgery? What does it feel like to have nail surgery? Once the toe has been anaesthetised (numbed), you will be able to move the toe, but will not feel any pain. There is some discomfort when injecting the anaesthetic, but this only lasts a couple of minutes. The local anaesthetic usually wears off in 2-4 hours. What would my toe look like afterwards? Below is an example of a before and after picture for an infected ingrowing toenail. The result of your procedure will depend on your particular toenail problem, and the exact procedure. Will nail surgery affect work or school? You may bring a relative/friend/carer with you for support; however, this is not essential unless you are under 16 years old.